"Loma Blanca is off on its own, an obscure peak not often climbed," Ted says, "but there's an amazing view from the top as you look back on the Fitz Roy range. I call this picture 'alien walk'—it captures the feel of the place." Z 7, NIKKOR Z 14-30mm f/4 S, 1/320 second, f/5, ISO 100, manual exposure, 3D Color Matrix metering. "This is the prime reason we went to Loma Blanca," Ted says. "We figured out, using PhotoPills, that the Milky Way would line up right on top of Fitz Roy from this vantage point. What's going on in the image is pretty cool—the moon is setting and we're getting color from its reflected light, so the Fitz Roy range is being lit up by that light. It's a tripod image at ISO 6400—higher than I'd normally go, but I found it can work. Noise reduction was on and I did a little software work on it. Pretty crazy that you can shoot that high an ISO and not see any physical noise." Z 7, NIKKOR Z 14-30mm f/4 S, 30 seconds, f/4, ISO 6400, manual exposure, 3D Color Matrix metering. Ted Hesser is a climber and a photographer. He takes breathtaking pictures in places most of us will never visit. The Z 7 is a high-performance, high-megapixel camera for the kind of pictures most of us will take in places we will visit, but it's also a rugged, weather-sealed camera built to handle the extremes of...well, places adventurous outdoor enthusiasts and pro shooters visit often. And extremes is where Ted comes in. 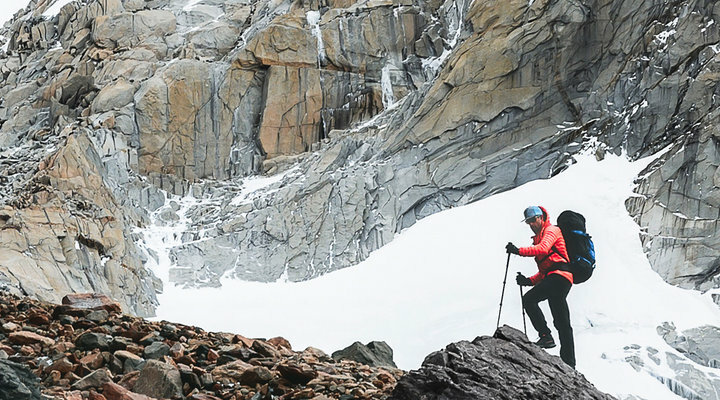 When we heard he was heading off on a five-week mission to climb the peaks of Patagonia's Fitz Roy range, we saw the perfect opportunity to put the Z 7 to its toughest test yet. A formation called El Mocho offers a unique vantage point for viewing Cerro Torre mountain. "This is an example of what I think is a really important quality to look for in a lens: how does it handle a starburst? A beautiful starburst like this from a zoom at 14mm? That speaks for itself. I took the color out later—it looked more dramatic in black and white—but in Adobe Photoshop I created luminosity masks to selectively and subtly add a bit of color back to certain sections." Z 7, NIKKOR Z 14-30mm f/4 S, 1/100 second, f/22, ISO 200, manual exposure, 3D Color Matrix metering. Climbing the Aguja de l'S peak on the southern flank of the Fitz Roy range. Z 7, NIKKOR Z 14-30mm f/4 S, 1/80 second, f/5.6, ISO 31, manual exposure, 3D Color Matrix metering. Climbing in Patagonia is rough going. "What generally destroys gear is the volume of rocky terrain you cover," Ted says. And it's dangerous going. "Alpine climbing, especially in Patagonia, has to be fast and light—that's where safety comes from in those mountains. It's all about you and your partner's ability to move quickly, to get down and away from weather. The weather is the big x-factor here—it's volatile—so we really count the ounces in all our kits." For the savvy climber it's climb quickly and carry as little as possible. Ted doesn't even carry lens caps; every ounce, every fraction of an ounce, counts. Hiking towards the Fitz Roy range in the early morning, the stars still visible in the sky. "We got up at 2:30 in the morning to set out for nine or ten miles to get there for sunrise pictures." Z 7, NIKKOR Z 14-30mm f/4 S, 13 seconds, f/4, ISO 1600, manual exposure, highlight-weighted metering. Fitz Roy at sunset from the top of Loma Blanca peak. "We spent days trying to get on top of this peak to sleep up there to get photos at sunrise and sunset. There was no information on how to climb it, and it took a whole day of reconnaissance to find the path of easiest ascent." Z 7, NIKKOR Z 14-30mm f/4 S, 1/60 second, f/5, ISO 100, manual exposure, 3D Color Matrix metering. A three-image panorama of the Fitz Roy range from Loma Blanca. "This was the view outside our tent," Ted says. "The winds were picking up and we had to get off the mountain quickly, but we were able to stay for sunrise. I cropped it square in post because I put my portfolio on social media and square is the preferable format." Z 7, NIKKOR Z 14-30mm f/4 S, 1/320 second, f/4.5, ISO 64, manual exposure, 3D Color Matrix metering. Fitz Roy in the early morning with a 2.1 neutral density filter on the lens and long-exposure tripod support for the camera. "This far south in the early morning there's a purplish pre-dawn light that covers the range," Ted says. "I caught it just as a storm was clearing—you can see half the peaks of the range in the distance." Z 7, NIKKOR Z 14-30mm f/4 S, 30 seconds, f/8, ISO 64, manual exposure, highlight-weighted metering. On the northern flank of the Fitz Roy range. "The steep hill is a setup place for a lot of climbers' high camps," Ted says. "My climbing partner and I went up to cache some climbing gear—you bring the gear ahead of time, stash it, then go back to town, and when the weather's good, you come back up to the gear lighter and faster. I saw the beautiful streaking light coming across the valley; the river pops because of the circular polarizer on the lens." Z 7, NIKKOR Z 24-70mm f/4 S, 1/40 second, f/11, ISO 64, aperture-priority, 3D Color Matrix metering. Ted had brought along his D850—but he never used it, which says a lot about the image quality delivered by the mirrorless. "Because of its sensor, to me the Z 7 is basically a medium-format camera at this point," he says. "It delivers incredible images, and there's so much room to work on an image, so much tolerance for adjustment if you want or need it." It turned out that the Z 7 and its lenses was put to more of a test than first anticipated as the unpredictability of the weather turned out to have a positive side. "We had so much good climbing weather that we extended the trip by two weeks," Ted says. All told, he climbed six major peaks during that time and took...wait for it... not quite a mountain of images. A black-and-white conversion with color added back to selected sections. Ted positioned his climbing partner at the rock to glacier transition point on their way to the Fitz Roy advance base camp for the high climb. "Fitz Roy is a test-your-skills, serious and dangerous mountain." Z 7, NIKKOR Z 24-70mm f/4 S, 1/640 second, f/5.6, ISO 64, manual exposure, 3D Color Matrix metering. There was one additional, though not intended test. "This is worth calling out," Ted says, "and it was my biggest surprise about the camera. I wasn't sure how long the batteries would last in the cold, and at the beginning I'd bring along two batteries for each day I went out because I didn't know what to expect. Near the end of the trip I was bringing one battery for every two days. For the last climb I was out five days and brought three batteries and used one. From the start, the batteries for the Z 7 lasted just as long as the ones for my D850 up there in the mountains." Which prompted us to ask about the temperatures up there. "It would get as cold as zero," Ted says. Like we said, "...breathtaking pictures in places most of us will never visit." Approaching Guillaumet peak on the northern flank of Fitz Roy on the way up to the advance base camp. "The approach was set up well for a photo like this, and we spent ten minutes or so getting it. It's part of the fun." Z 7, NIKKOR Z 24-70mm f/4 S, 1/200 second, f/6.3, ISO 64, aperture-priority exposure, 3D Color Matrix metering. "This is the top of Loma Blanca, near where we camped for the climb up Fitz Roy peak. This was definitely two lens territory—the 24-70 and the 14-30. I don't need other lenses if I go into the mountains." Z 7, NIKKOR Z 24-70mm f/4 S, 1/160 second, f/5.6, ISO 100, manual exposure, 3D Color Matrix metering. Visit www.tedhesser.com to view a variety of Ted's outdoor, adventure and travel photographs.